The Documents folder is the default working folder for all of the files that you create in your Microsoft Office programs. You can choose a different default working folder. Note: In Office 2007, the Documents folder is called My Documents. Note: The folder that you select applies only to the program that you are currently using. For example, if you change the default working folder for Word, the default working folder for PowerPoint is still Documents. Under Creating databases, in the Default database folder box, click Browse and navigate to the default database folder you want, or type the path of the folder where you want to store Access database files. Note: In Word you can also click Browse to navigate to the folder you want to use. Click General, and then, under InfoPath Options, click More Options. At the Project location for Visual Basic and C# code: field, Browse to the new default folder and click Open. When you set a default working folder in Visio, the folder that you designate for a particular type of file is the first place that Visio searches for any file of that type. If Visio fails to find a specific file in the designated folder, it searches in the My Documents folder for drawings and templates and in the My Documents\My Shapes folder for stencils. It searches in the Documents and Settings\user name folder for add-ins. Note: You can add more than one folder for each file type. If you do so, the first folder is the default working folder. If the first folder is not available (for example, a network share that may be temporarily unavailable), Visio uses the next folder in the list. Property report definitions that are saved to these locations are available in the Reports dialog box. Find links to more information about property reports in the See Also section. In the Save in list, click My Documents. Click Up One Level . In the folders list, right-click the My Documents folder, and then click Rename on the shortcut menu. Type a new folder name, and then press ENTER. Note: You may need to close the Save As dialog box and open it again before the change is visible in the My Places bar and the Save in list. Note: The folder that you select applies only to the program that you are currently using. For example, if you change the default working folder for Word, the default working folder for PowerPoint will still be My Documents. Under Creating databases, in the Default database folder box, type the path of the folder where you want to store Access database files. 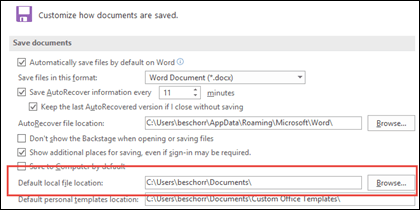 Under Save workbooks, type the path in the Default file location box. On the Tools menu, click Options and then click the Design tab. In the File types list, double-click Projects. Browse to the new default working folder, and double-click the folder. If you want to create a new working folder, click Create New Folder , and then in the New Folder dialog box, in the Name box, type a name for the new folder, and then click OK. In the Modify Location dialog box, click OK.
On the File menu, click Save As . Navigate to the new folder and double-click to open, or click Open. Click OK to save your changes to the new folder. Note: You cannot change the default folder in Publisher. On the Advanced tab, click File Paths. Under Save documents, next to the Default file location box, click Browse. Browse to the new default working folder, and then click OK.